Everyone is invited to Investors Bank's branch in Bensonhurst, Brooklyn to meet New York Giants Alumni Jim Burt. He was a nose tackle with the Giants from 1981 to 1988. New York Giants Alumni Sean Landeta is visiting the Investors Bank branch in Wantagh. Landeta was a punter with the Giants from 1985 to 1993. Football fans of all ages are welcome to meet New York Giants Alumni, take photos, get autographs and enter a drawing to win an exclusive prize. MELVILLE, NEW YORK , UNITED STATES OF AMERICA, January 11, 2019 /EINPresswire.com/ -- New York Giants Alumni are going to the Investors Bank's retail branches listed below on Saturday, January 12 and will meet with fans from 10:30 a.m. to noon. Everyone is invited to the branches, which are located in Bensonhurst, Brooklyn and Wantagh on Long Island, to visit with the New York Giants Alumni who will pose for photos and sign autographs. In celebration of the alliance between the New York Giants and Investors Bank, guests may register for a drawing to win an exclusive prize. •	Meet Jim Burt at Bensonhurst-86th Street branch (8601 21st Avenue in Brooklyn. Burt, who was selected for the Pro Bowl in 1986, was a nose tackle with the Giants from 1981 to 1988 and played for Big Blue in Super Bowl XXI. •	Meet Sean Landeta at the Wantagh branch (1164 Wantagh Avenue. Landeta was a punter with the Giants from 1985 to 1993, and he played for Big Blue in Super Bowls XXI and XXV. 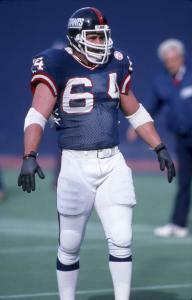 He is a two-time Pro Bowl player (1986 & ‘90). A cornerstone franchise of the National Football League, the New York Giants began play in 1925. With eight championships, including a victory over the New England Patriots in Super Bowl XLVI, their second in five seasons, the Giants are the only franchise in the NFL with a Super Bowl victory in each of the last four decades. Headquartered at the Quest Diagnostics Training Center in East Rutherford, N.J., the Giants enter their 94th season of play this fall. For more information, visit www.giants.com.